No, you’re not dreaming… I’m talking sensuously sweet, toothache-inducing crumbly fudge flavoured just how you like it in under 10 minutes! You don’t need a sugar thermometer or skills that Fanny Cradock would be proud of you just need a microwave and a handful of ingredients. 1. Grab the largest microwaveable bowl in the kitchen and add the condensed milk, butter and sugars. No need to mix just ensure that the container is LARGE because the contents are going to bubble up furiously and splattered fudge mix is way not cool to clean off. 2. For a 900W microwave, cook the mixture on full power for 9 minutes, removing the bowl for stirring every 3 minutes. If your microwave has a lower wattage you’ll need to cook the mixture for longer. Add 1 minute of cooking time for every 50W less power. 3. Once the cooking time has finished, add in the vanilla extract and Baileys and beat the mixture until it begins to look smooth and glossy. 4. Transfer the fudge mixture into a 9″ square tin to cool. You can be smart and line the tin with greaseproof paper to prevent sticking or just hook it out crumbled bits and all like I do. Once the mixture has cooled to room temperature, you can pop it in the fridge for a firmer set if required. One of the charms (there are many) of homemade fudge is the limitless scope for wonderful flavours… I’m thinking chocolate & mint for my next batch, or maybe peanut butter or mmmmm honey and walnut?! If you were to whip up a batch of fudge… what would be your flavour of choice? Charlotte, you are a woman very much after my own heart. Wish I had a blimmin’ microwave. ARGH. We don’t have a microwave, but this is making me re-think my ‘don’t need a microwave’ stance. ^^ How do you two survive without microwaves? OMG. My microwave is as essential as like, oxygen. It’s getting harder. There’s this, and Bliss have repackaged their Poetic Waxing into a kit that requires a microwave rather than a pan of boiling water. For actual food, I tend to make tomato based pasta/rice sauces mostly, and I do those on the stove-top. Ahhh. Yeah, I do the same with tomato sauces, but don’t you have some left over? I just find it really quick and easy to put some rice in a microwave bowl, plop some sauce on top and set it on high for three minutes. I’m lazy, though! mmmmm! 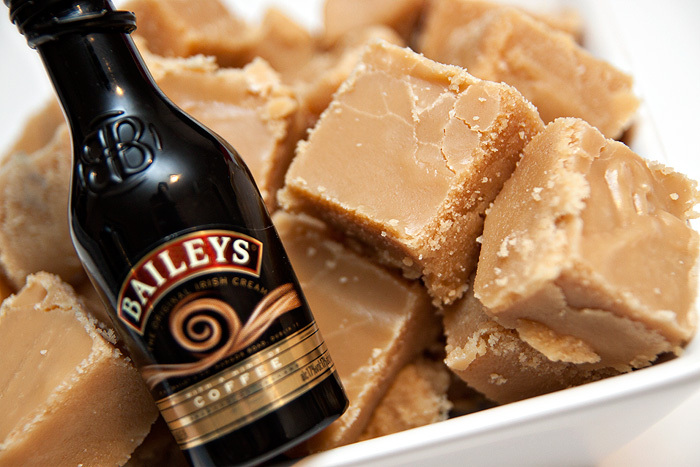 I love fudge, and I love Baileys – unbeatable combo. My decision to diet now hates you! I’d love to try this but would probably make it explode into a fudge catastrophe. This reminds me of a shop in Rochester (Kent) that does so many different varieties of fudge, I feel fat just thinking about it. OMG. That looks amazing. I didn’t even know you could make fudge in the microwave. That’s the best thing I’ve learned today! I have to try it and I think I’ll be trying amaretto as my first flavour. …YES! This is going in the microwave right now! Woo! I could have sworn I pressed submit…Clearly not. Yay! You blogged it. I am so making this as soon as I get time. I shouldn’t really eat fudge but… NOM! Also – what September Lena said – HOW can people live without microwaves?? If you are, you shouldn’t be! Oh my, these look amazing. 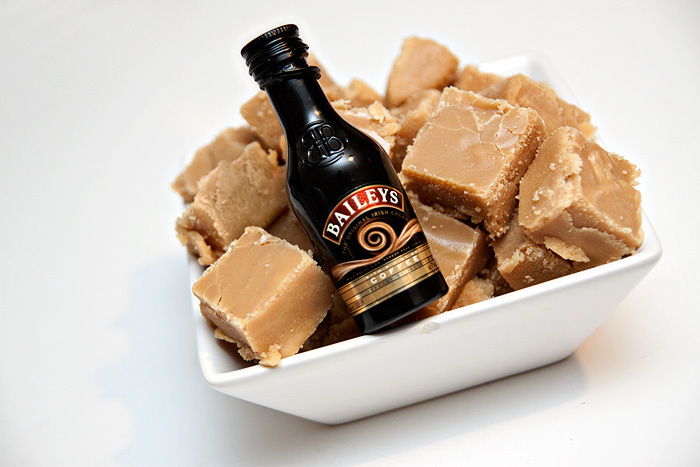 You’re making me crave Bailey’s fudge at 11:20pm!! Going to have to give this recipe a go… yummer. I don’t have a microwave! Oh my I may have to go buy the ingredients like, now! For all those worried about no micro I don’t see why this wouldn’t work by heating gently in a pan? it should work. you just have to remember to beat the living daylights out of it either way to mix well! In a two fingers up to dieting, I have made this with Hazelnut Bailey’s (we have rather a lot of the stuff thanks to the mother in law being back on the wagon). I am now licking then bowl. Wowweeeee is all I can say!! Literally eating this off the spoon right now…. it is amaaaaazing!!! So so quick and easy and just wow!! Never making fudge in a pan again….. Thanks so much for the recipe!!!! Make this now!!!! it must reach 116 degree, you need to invest in a cooking thermometer, it will deff set after that..